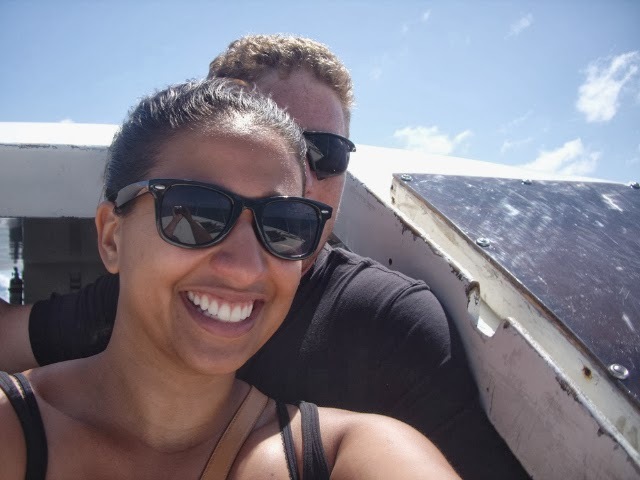 After a month in Utila, Honduras, my husband and I indulged in many lazy daze on the bay (literally, that was the name of our guesthouse) interspersed with a daily snorkel session and walk through town. Our stay on the island was coming to an end though, which meant a kick in the pants for our day-to-day pace of life. 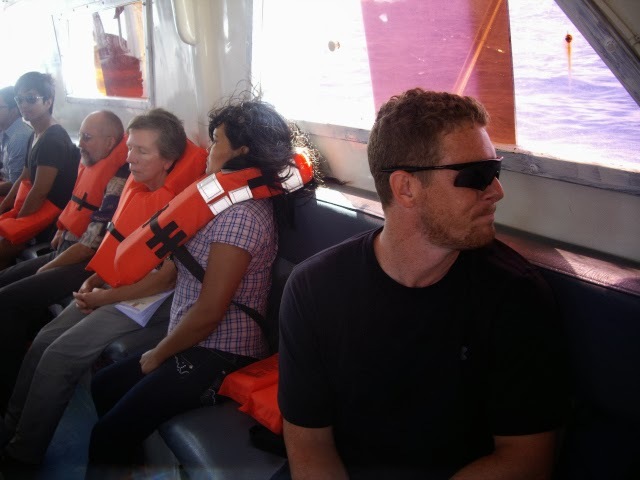 On Sunday morning we started our two day trip from Utila, Honduras, to Placencia, Belize with our backpacks, bottles of water, and snacks for the day. At 5.45am we walked to the Utila Princess ferry dock to buy tickets for the 6.20am trip to mainland Honduras (by the way, the ferry has been relocated to the eastern part of Utila Town until Sept. 2014 while they are repairing the main dock). Each ticket comes with a complimentary tablet of anti-nausea medicine, which leaves little mystery as to why this ferry is affectionately nicknamed the Vomit Comet. I took Dramamine in advance and that, combined with relatively calm waters, made for an easy commute. I even dozed off once or twice despite the bouncing. None of the windows open on the ferry though so a little air flow would've been much appreciated. At $25 US per ticket, this ferry was more within our budget compared to the $70 per person price tag if we were to catch a 20 minute flight. Fortunately the weather was clear and our ferry reached La Ceiba, the town on mainland Honduras, by 7.30am. We paid $5 US per person for a 20 minute taxi ride to the Diana Express bus station and bought two tickets to San Pedro Sula, the transportation hub of the country. We were hoping to take a route along the coast until we reached Puerto Cortes where we'd board our final leg of the trip to Placencia, Belize. Sadly, that option wasn't serviced by public bus companies so off to SPS we went. By 8.30am we were sitting on a bus (comparable but not as good as Greyhound) for a 3.5 hour trip costing $5.25 US per person. The ride was comfortable enough and the lull of the bus knocked us both out for the majority of the trip. We had a rest stop along the way where we were grateful for los banos (relatively clean but bring your own toilet paper). Around 12pm we arrived at the massive SPS bus terminal and made our way downstairs, declining many taxi offers along the way. 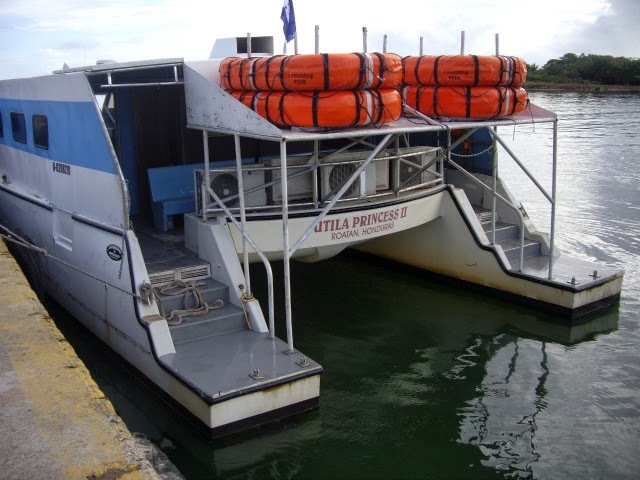 Prior to leaving Utila I'd learned that only two bus companies offered trips to Puerto Coretes, Impala and Expresos del Atlantico, so we bought tickets for the next available departure (Impala for $2.50 US). The collectivo was jam packed and we made many (I mean, 20+) stops along the way so sleep was but a dream. It took about 90 minutes to reach the biggest western port in Honduras where the most genuine and helpful taxi driver drove us to the tourist office so we could buy our ferry tickets to Belize for the next day ($65 US per person). He also graciously drove us to a nearby ATM so I could pull out some more money for the rest of the trip (our taxi ride from the bus stop to office to the ATM to our hotel cost a total of $5 US). 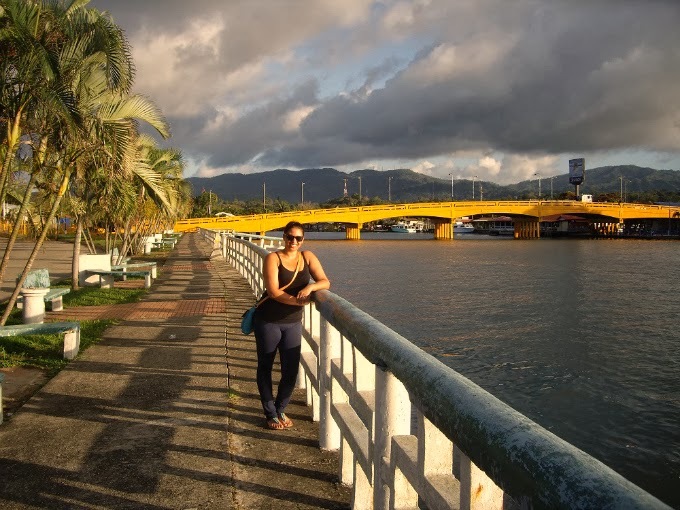 There aren't many budget hotel options in Puerto Cortes, but our taxi driver suggested the Prince Wilson Hotel as it is right beside the ferry port and for $25 a night with AC it was a good value. I wouldn't stay there long term but for a quick one day stopover it was a decent choice. On Monday morning around 9am we went back to the ferry office to confirm our spots on the D-Express to Belize then walked next door to the most relaxed immigration center I've ever seen to get our exit stamps out of Honduras. We still had about an hour before departing so we had time for one last meal of Honduras' national dish, baleadas, which consists of fried tortillas with cabbage, tomatoes, sauce, and that morning, fried chicken. Now let me tell you about this ride to Belize. If any ferry should be nicknamed the Vomit Comet, it's this one. The staff handed out life jackets and everyone put them on immediately which I thought was a little unnecessary (not to mention completely foreboding). Three solid hours of ball busting is how my husband described the ride. At the beginning it was amusing how the waves were so big that literally every 30 seconds we'd come crashing down on our seats. I caught eyes with passengers around me who were laughing at what a fun experience this was. After 20 minutes though, it was like a never-ending carnival ride that wasn't so fun anymore. One passenger in particular who was sitting across from me got that queasy look across his face. I offered him one of my seasickness pills (by that time I'd already taken two) but it was too late. "Bolsa, bolsa!" his friend yelled and someone shoved a plastic bag in the his hand right in time. I tried to tune out his retching and diverted my eyes to the right only to see another passenger doing the same thing, this time into a clear ziploc bag. The stench of vomit filled the air and I thought for sure I was going to be next. I tucked my nose into my arm and looked in the only direction that was safe, at M who was sitting on my left. After a few minutes of deep breathing I was back to alright. Towards the front of the ferry there was a door hatch that was left open and there we stood with our knees bent, "riding the waves" as my husband liked to call it. He'd spent seven months aboard a US Navy ship when he deployed as a Marine so he had a fair amount of experience in dealing with seasickness. Being able to stand up and get air flow were his two biggest necessities and they certainly worked on this occasion. With the wind whipping my face it felt a lot more fun out there instead of in the hatchet. 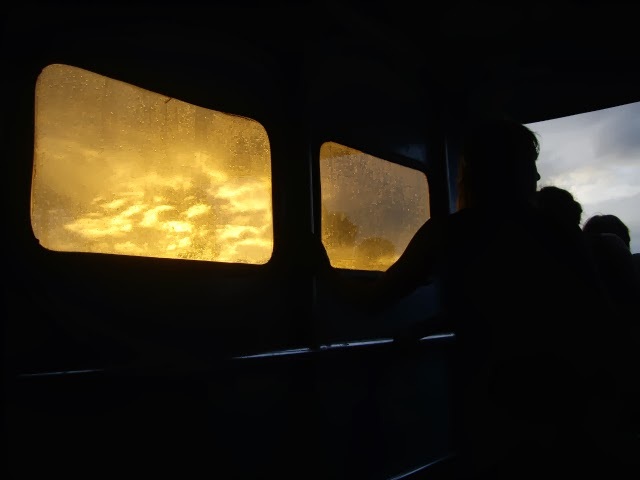 Around 2pm we arrived in Mango Creek where a Belizean immigration officer boarded the ferry and stamped our passports. Those who were travelling to Dangriga got on an awaiting bus. For those who continued to Placencia, it was a quick 10 minute ride through the lagoon to our destination. 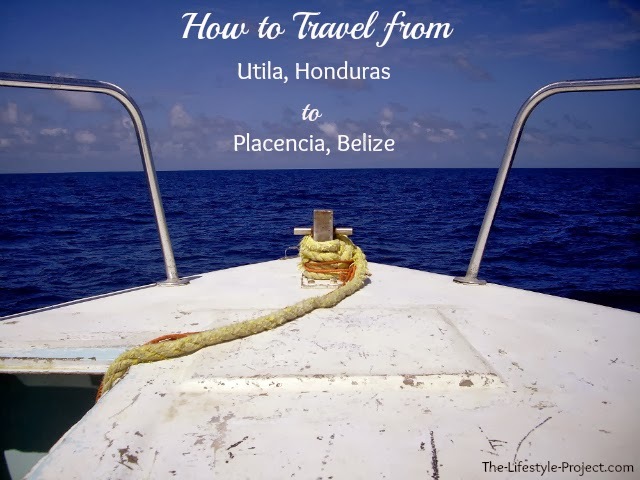 If you're hoping to travel from Utila, Honduras to Placencia, Belize and follow this route, it's important to note that the international ferry to Belize only departs once a week on Mondays at 11am. If you miss the boat, another option is to bus to Guatemala then onward to Dangriga up the Belizean coast.